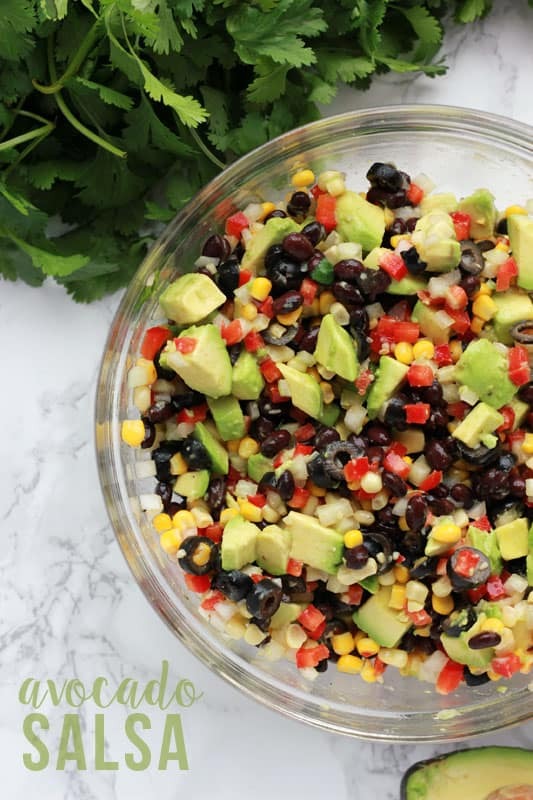 This mouth-watering Avocado Salsa is a summer side dish staple! 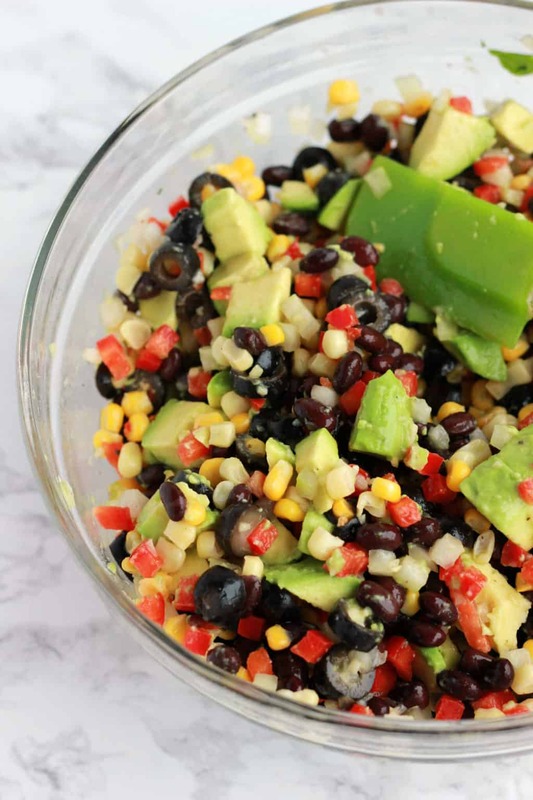 Made with ripe avocado, black beans, sweet peppers, and onions – Perfect to take to potlucks! Ease and flavor are two of the most important qualities I look for in a recipe. Especially if it is a dish I plan on serving at our summer barbecues or picnics. THIS avocado salsa is the perfect appetizer or side dish recipe. Making it is as easy as stirring ingredients and serve. I LOVE that this is made ahead of time. That means I can worry about getting my kid out the door and not fuss over food. The ingredients blend together overnight leaving you with the perfect salsa that has a punch of flavor. Substituting the typical tomato for avocado is a bold choice that you will not regret! We like to serve this easy salsa with chips. Making this avocado recipe is incredibly simple. The most time consuming part is gathering ingredients. Once you have everything before you it’s easy peasy. 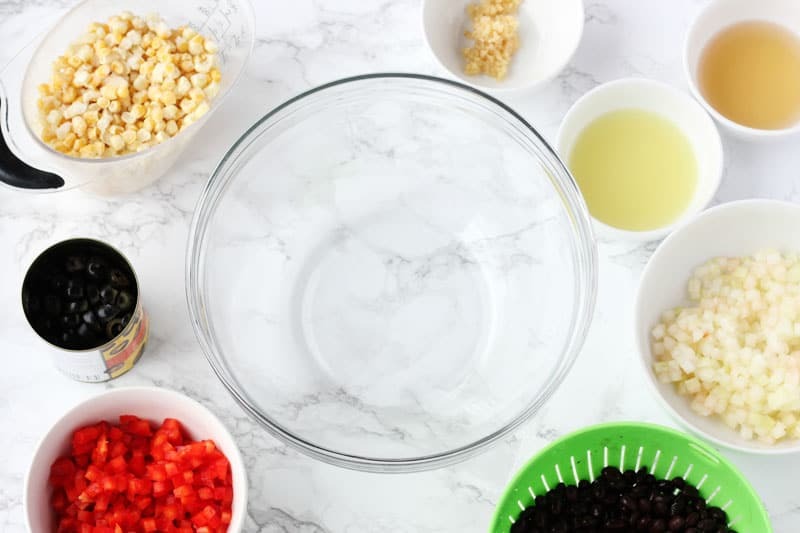 Stir together sweet corn, sliced olives, chopped red pepper, onion, black beans, garlic, lime juice, and vinegar. Season with salt, pepper, and cilantro. Peel and chop avocados into small pieces. Stir in just before serving. Make sure you wait to dice your avocado until you are ready to serve. Avocados brown quickly. We take a small cutting board to our event and quickly dice them on site. It makes for a beautiful dip that disappears quickly! Picking a ripe avocado can be tricky. Follow the tips below to help you find the best in the batch! Check the color. A ripe avocado will tend to be on the dark side. You will be looking for an almost black color with a slight green hue. If you will not be using your avocados for a few days, I suggest purchasing an avocado that is more green than dark in color. Gently press the avocado with your thumb. A ripe avocado will give slightly under the pressure but will not be mushy. Slice the avocado directly in half. Gently peel and seed, making sure to keep the avocado half in tact. Dip or brush your avocado in lemon juice. Tightly wrap in plastic wrap. Place in a zip top bag. Label and freeze. Pull one out whenever you are ready to use. Peel, seed, and slightly dice your avocados. Place in a medium sized bowl. Squeeze the juice of half of a lemon into the bowl. Mash to your desired consistency. Place in a freezer safe zip top bag. Squeeze out all of the air, label, and freeze. This way is ideal for quick avocado toast or guacamole! 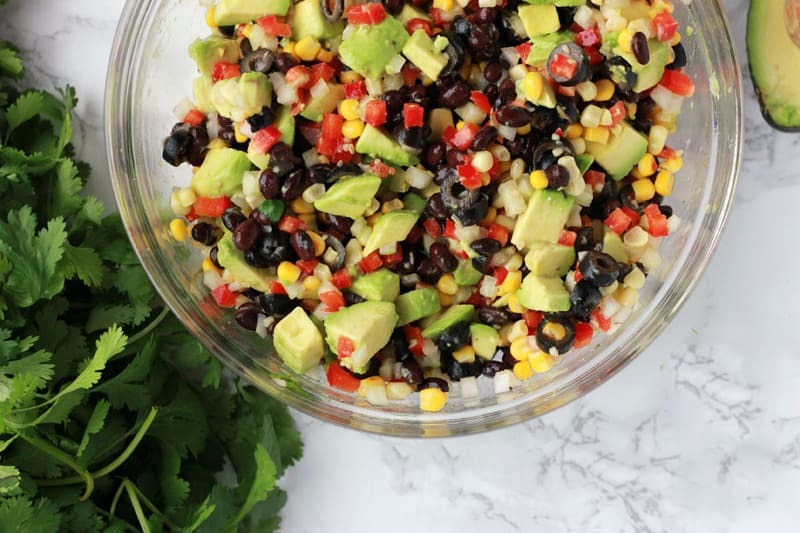 This mouth-watering Avocado Salsa is a summer side dish staple! 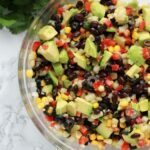 Made with ripe avocado, black beans, sweet peppers, and onions - Perfect to take to potlucks! Stir the first 11 ingredients in a large bowl. Cover and chill overnight or at least 8 hours. Stir in chopped avocados and serve. OMG! THAT IS WHAT THOSE CHALK BOARD SIGNS ARE FOR!!!! I actually broke the sign off of the stick and glued it to a clothes pin!! It stays put MUCH better! Is the seed still in, I heard that if you leave it in the avocados will not turn, is that ture? A family member of mine works for Mission Avocado’s, and he is the one that told me about that trick. It doesn’t keep it from turning brown forever, but it does prolong the process! I kept this salsa in the fridge for two days before I noticed any change in color. I leave it in my guacamole as well! I was wondering if I have to use vinegar in this recipe? I cannot stand it, and in most recipes I either sub, or omit all together. No vinegar so you should be good! Did anyone else notice that black beans are not listed in the written part of this recipe? How much do you put in? I’ve mDe this before but didn’t put the beans in and it was amazing.